To Nina Borthen on the "Ships starting with N" page. Tonnage: 6123 gt, 9400 tdwt. Built by Sir W.G. Armstrong, Whitworth & Co., Newcastle in 1930. As will be seen when going to the archive document above, Nina Borthen was in Galveston when war broke out in Norway on Apr. 9-1940, having arrived there on Apr. 8. On May 11, she proceeded to Gibraltar, arriving June 4, and on June 13 she joined the convoy in which M/S Tudor was sunk, namely Convoy HGF 34 - follow the links for details. Kollskegg, John P. Pedersen and Svein Jarl also took part. "Nortraships flåte" mentions that HMS Arabis, one of the escorts of that convoy received a message from Nina Borthen on June 21 that a surfaced U-boat had been sighted. She arrived Southampton on June 30. In July that year Arnold Hague has included her, together with Kollskegg and Rimac, in Convoy CW 7 (Southend-Falmouth convoy, July 20/July 22 - external link; according to the archive document, Nina Borthen had sailed from Southampton, July 20). The convoy was attacked several times by a total of nearly 80 aircraft on July 21. Nina Borthen was damaged in one of the first attacks, but no one was hurt and she sought refuge in The Spithead (the archive document says she arrived Southampton on July 22 and it looks like she underwent repairs there. She left Southampton on Sept. 27 for Falmouth, where she arrived on the 28th). Kollskegg was also damaged; follow the link above to my page about this ship for more details. By this time the Germans had won the entire continental coast from far up north to the Spanish border in the south, which enabled them to use Dutch, Belgian or French airfields as their points of origin, rather than having to use the ones in Germany. E-boats (torpedo boats) had a short distance to offensive operations against shipping on the British east coast, and the U-boats also had a shorter distance to travel to the British Atlantic inlets where ships assembled and offered good targets. From the beginning of July the German Air Force started hammering British coastal shipping and ports. When France had fallen the ports in the channel had been closed, and the transoceanic convoys were redirected north of Ireland. The ports on the west coast then became overloaded convoy terminals, while the ports on the east coast were practically empty. It was soon realized that this could not work in the long run. The overland transportation network could not handle the large amounts of supplies discharged by the convoys on the west coast, a considerable amount of which had to get to the densely populated areas in the east, like London, so ships had to be used to get sufficient goods delivered. Therefore, traffic to the cities on the east coast was directed around Scotland, and in July it was again necessary to reestablish direct sailings between the Thames and the Bristol channel, past Dover. When the Germans intensified their air attacks on the British coastal traffic in July, Norwegian ships were in the most dangerous passage of all, the Dover passage, and several were sunk or damaged. Improved measures for convoy defense were put to use, which reduced the losses for a while, but from Aug.-1940 German planes started swarming across the entire island kingdom in their search for ships, and the number of losses again went up considerably. As mentioned above, Nina Borthen had arrived Falmouth from Southampton on Sept. 28-1940, then proceeded to Milford Haven (again, see the archive document). She left Milford Haven on Sept. 30 in convoy* for Table Bay - Persian Gulf, and disappeared, the only trace being a lifeboat which was washed ashore near Dunmore, Ireland on Dec. 19. The convoy was dispersed in a gale on Oct. 5, and since she did not reach her destination she was believed to have been sunk between Milford Haven and Table Bay (she only had 300 tons of bunkers, so could not have reached much further). * This must have been Convoy OB 222, in which she's listed as bound for Abadan/Cape in ballast, station 65. This convoy originated in Liverpool on Oct. 1-1940, rendezvoused with OA 222 on Oct. 3 and was dispersed on the 5th (ref external links at the end of this page. A. Hague has also included Varøy in this convoy, she had started out in OA 222). U-103 (Schütze) sank a tanker on Oct. 6 in position 54N 26W, which is said to be in the area where the convoy was dispersed and where Nina Borthen would have been on her way south on her own. "Nortraships flåte" gives the position as 53N 25W and adds that Schütze could not identify the ship in the dark, but I'm not sure this statement is correct, as Nina Borthen is listed by J. Rohwer as sunk by this U-boat with no notes attached, so I get the impression she was identified. (Charles Hocking gives position as "midway between Inishtrahull and Cape Farewell"). "At 22.04 hours on 6 Oct, 1940, the Nina Borthen (Master Bjarne Nielsen) was hit by one torpedo from U-103 and developed a list, but this was corrected by the crew. The ship was then hit by two coups de grâce at 22.14 and 22.38 hours and began to list to port, when she was hit by a fourth torpedo at 23.30 hours, broke in two and sank". For info, U-103 was also responsible for the attacks on Benjamin Franklin and Polyana the following year. 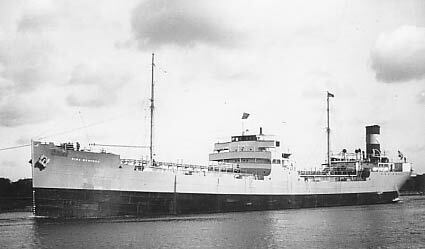 ("Nortraships flåte" claims she had a complement of 28 Norwegians and 7 British). * Jacob L. Bentsen had previously served on Vilja. The cook had previously served on Fido. OB (& OA) convoys - As will be seen, Nina Borthen is listed in Convoy OB 222. Here's Arnold Hague's info for OB 222 and OA 222. Stavern Memorial commemorations - 25 Norwegians are commemorated at this memorial for seamen in Stavern, Norway. Back to Nina Borthen on the "Ships starting with N" page. 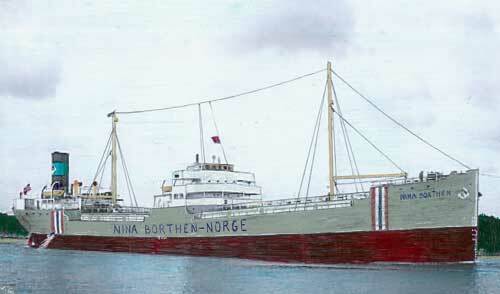 Other ships by this name: Another Nina Borthen, also a tanker, was built for Harry Borthen & Co. by Burmeister & Wain, Copenhagen in 1948, 8627 gt. See this posting to my Ship Forum. Also, I have a picture of a lovely painting of another post war ship by this name, painted by Jan Goedhart, Holland who sailed on her. If anyone would like to have this picture, please contact me through the address provided at the end of this page. Jan says she was built in Horten in 1962 for Harry Borthen & Co. A/S, Oslo. Sold in 1968, renamed Gylfe for Eiv. Evensen, Oslo. Sold in 1976, renamed Dea Brøvig for Th. Brøvig, Farsund. Sold to Greece in 1984, renamed Warlord. Broken up in 1985. The text on this page was compiled with the help of: "Nortraships flåte", J. R. Hegland, "Krigsseileren", Issue No. 1 for 1974, "Sjøforklaringer fra 2. verdenskrig", Norwegian Maritime Museum, Volume II, and misc. (ref. My sources).